While piano (or pianola) rolls might seem the ultimate in technological obsolescence, rare music was delighted to accept a generous donation of 126 piano rolls (just part of a larger collection) last year. Piano rolls were first available for purchase in the mid-1890s and are, surprisingly, still being produced today, though only one company remains (QRS). 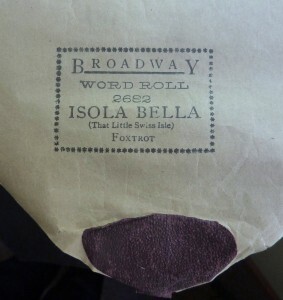 For those unfamiliar with them, a piano roll consists of a roll of paper, 285 mm wide, wound onto a spool, with tiny holes (perforations) punched out that encode musical information such as the notes to be played and when the “soft” and sustaining pedals are to be depressed. Early pianolas (or player pianos) were powered by a pair of foot treadles with a “tracker bar” (visible on the photograph of Percy Grainger above) reading the roll and “playing” the piano. There was also scope for the “player pianist” to control aspects of the sounds that were made; volume and speed, for example. With technological advances, manufacturers developed high-end, high fidelity “reproducing” pianos which offered something very different: fidelity to the interpretation of the best-known virtuoso pianists of the day. 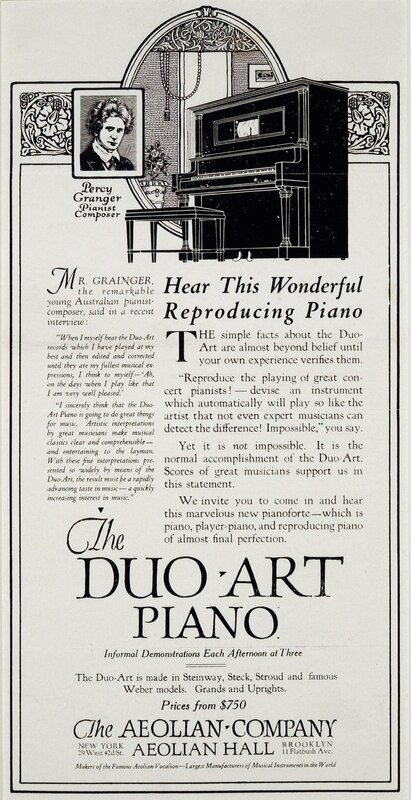 The Grainger Museum’s Duo-Art piano, belonging to Percy Grainger, is one of this type. 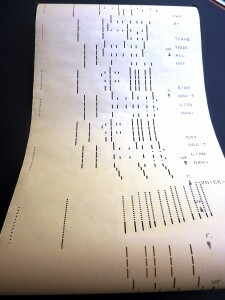 Grainger sometimes modified piano roll recordings of his performances for effect (rather than to just correct a mistake), adding additional holes to a roll, for example, and producing piano music that would otherwise be unplayable by just 10 fingers. 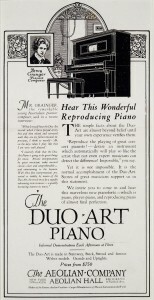 While Grainger, as an international pianist, recorded piano rolls overseas, the collection donated to Rare Music is all Australian-made and the music is mostly popular. Provenance-wise the rolls can be traced back to 1947 when they were located in an outbuilding on a Euroa property at the time it changed hands; just possibly, given the number of rolls, the collection functioned as a lending library of some type. The Australian rolls in our new acquisition were produced by the Anglo-American Player Roll Co. (Melbourne) and Mastertouch Piano Roll Co. (Sydney). The former business, producing Broadway Word Rolls, was essentially, a “one man show”, established around 1921 by Len Luscombe (1893-1957), who was both the sole recording artist and business owner. 1) His taste and interest was in popular dance music and our collection is dominated by fox trots plus a handful of waltzes and one-steps. Luscombe used a number of aliases to give the impression of a larger enterprise. “Word rolls”, by the way, have the lyrics written on the paper, parallel to the lines of perforations, and reveal themselves gradually as the roll turns–ready for singing along—very much as do the lyrics during karaoke. Sydney’s Mastertouch Company was a little different, involving a larger number of recording artists, including in-house “pianola pianists”. 2) The firm was established by George Horton in 1919 and closed as recently as 2005. 3) Lettie Keyes from Nathalia (near Shepparton) and Katoomba sisters Laurel and Edith Pardey (later Edith Murn) dominate the performer list. Keyes (active for Mastertouch from 1923-29, and from 1961) was both an accomplished pianist and a highly skilled arranger of music and editor of rolls. Keyes’s speciality was opera arrangements and our collection includes her selections from Rigoletto, Faust and Martha, which exploit that potential for a liberally “edited” piano roll to deliver a complex, almost orchestral texture. Four-handed arrangements were the specialty of the Pardey sisters, full-time employees of Mastertouch, specialising, like Luscombe, in popular music. The sisters recorded some Australian compositions, such as “After the Dawn: Waltz” by Jack O’Hagan (of Along the Road to Gundagai fame). The collection also includes a “Gippsland March”. Our collection also includes some “classical” repertoire, recorded by, for example, Russian pianist Paul Vinogradoff. Well-known pianists would simply visit and record, leaving staffers to edit for them. Piano rolls, like recordings made with other early technologies, are currently of interest to musicologists as a rich source of information on performance practice of a variety of types of music. Testament to that interest is the Player Piano Project at Stanford University; it was Stanford which acquired Australian Denis Condon’s massive collection of 7540 piano rolls (including only very few Australian rolls) and ten instruments in 2014. 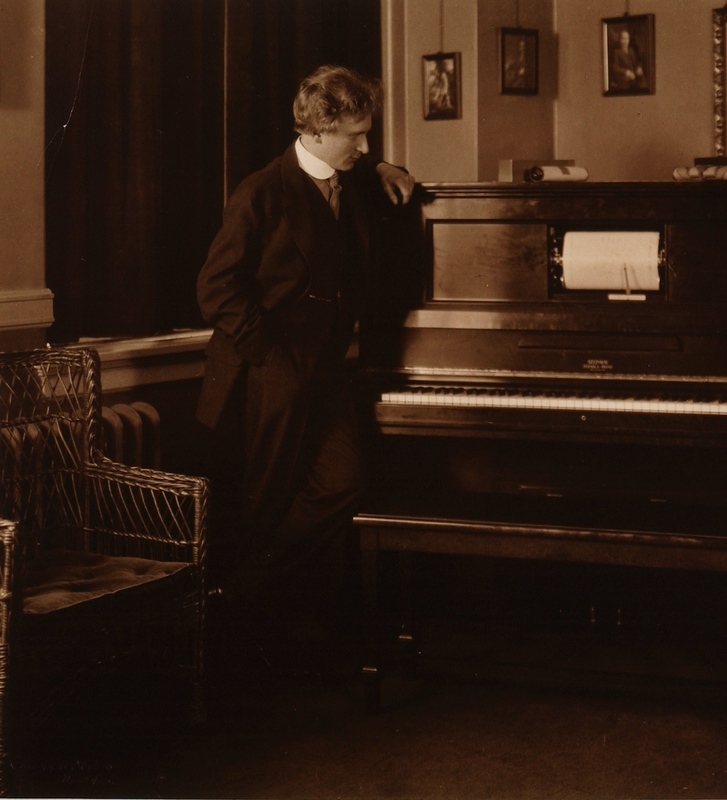 There are some fascinating videos associated with the project, including one of the Stanford Orchestra playing the first movement of Grieg’s Piano Concerto in A minor last year with Percy Grainger as soloist per-piano roll. Or to see a pianola in action close up, and to hear the distinctive popular “pianola sound”, sample Gershwin playing the opening of “I’m forever blowing bubbles”. Returning to the challenge of technological obsolescence, time has already overtaken an earlier plan to digitise the piano rolls by playing them on a pianola and recording them digitally in “real time”. Stanford is developing and will fabricate, a dedicated scanner for piano rolls that will allow them to derive audio from digital images; playback will be via an MP3 player or perhaps another type of player that is “e-roll” capable. Internet searches have revealed other recent advances in this area, so a “watching brief”, keeping a close eye on the Stanford project, is probably the best option for Rare Music. We shall have to be patient! 1) See Glenn Amer, “Len Luscombe: Australia’s premier piano roll pianist and arranger” and the article on Luscombe by Barclay Wright in the Australian Dictionary of Biography. 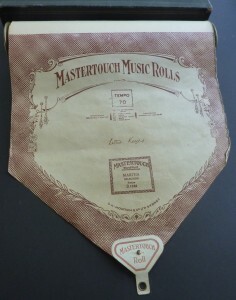 2) See Glenn Amer, “Artists of the Mastertouch Piano Roll Co. 1919-2006”. 3) The Anglo-American Player Roll Company’s stock and equipment was bought out by Horton after Luscombe’s death and the Powerhouse Museum, Sydney, acquired the Mastertouch Piano Roll Company collection on its closure.